Do You Know How to Roast Pumpkin Seeds? Opening day is just around the corner at our pumpkin patch and we couldn’t be more excited! Mark your calendars now for September 14 and come out to enjoy the best pumpkin farm in the Chicago area that has plenty of great fall foods and attractions to experience. In other words, there’s a lot to enjoy this year at Bengtson Farms! And of course as a pumpkin farm, people think of a great DIY fall food. Yes, we’re speaking of pumpkin seeds, and in today’s blog we’d like to go over a few tips for how to roast pumpkin seeds. If that sounds up your alley and you’re looking for something to get you into the fall spirit, today’s post is for you. Keep reading to learn more! All you need for an amazing treat is raw pumpkin seeds, butter, and salt. You can experiment with other flavors too, but we’ll provide readers with a few suggestions a little bit later. Depending on how you acquired your pumpkin seeds, they might need a bit of cleaning off to get them ready for roasting. If they have recently been removed from a pumpkin you might need to rinse them off just a bit. A quick rinse in a colander under cold water will do the trick! 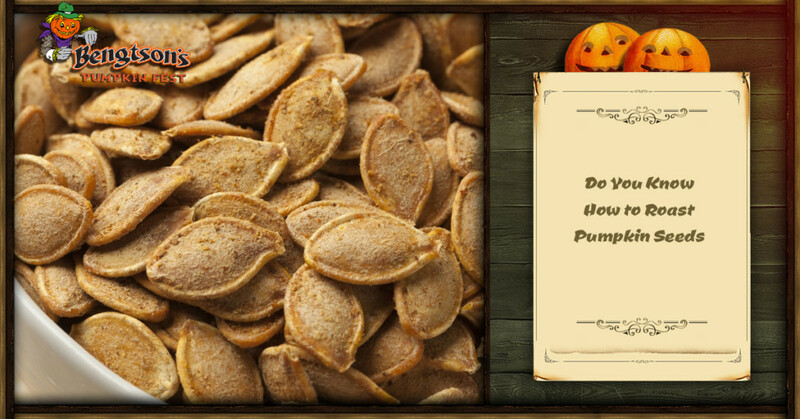 Once your pumpkin seeds are ready to go, toss the seeds with a bit of melted butter and salt. From there, all you have to do is bake your pumpkin seeds for 40 minutes in a 300 degree oven. Stir them occasionally and enjoy! Sprinkle your pumpkin seeds with a bit of cinnamon and sugar for a sweet treat that’s sure to please! A quick toss in garlic powder and a dusting of parmesan offers a savory experience that can’t be beat. This recipe from the folks over at Delish is a winner thanks to its combination of pumpkin seeds, butter, buffalo sauce, and a ranch seasoning packet. Get creative with your own take on roasted pumpkin seeds. They can be sweet, savory, or something in between. No matter what you choose to do with your pumpkin seeds, it’s a snack that’s delicious, healthy, and perfect for fall. And speaking of great fall foods, Bengtson Farms offers a great selection of eats and treats to enjoy! We have everything from barbecue to tacos to pizza to churros (new this year!) to our famous fresh apple cider donuts. In other words, there’s a lot to love about visiting our pumpkin patch. The countdown to our grand opening celebration has begun and with September 14 just days away, it’s time to start planning your trip to Bengtson Farms. We have a number of attractions to enjoy and there’s something for kids and adults alike. Plan your visit today to enjoy the best that fall has to offer. We look forward to seeing you!